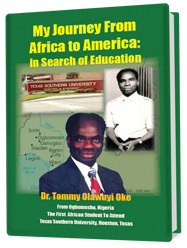 Author Dr. Tommy Olawuyi Oke’s story pays tribute to a remarkable journey from Nigeria through England to the United States in pursuit of education in his stirring biography, My Journey From Africa to America: In Search of Education. Poignantly written, this book tells the true story of Dr. Tommy Olawuyi Oke, the first African child from Ogbomosho, Nigeria, West Africa to travel to Houston, Texas to pursue his higher education, thereby establishing future history in the United States. Dr. Oke met “angels” along his journey who guided him through the rough passages and help him achieve his goals. He realized the value of the sacrifices he was making to place himself in position to be educated. His accomplishments have impacted his family and heritage for generations to come. In celebration, he shares his story, the pursuit of an education, a true blessing that made it possible to reach higher heights and be an inspiration to his family and others. © 2009. Dr. Tommy Olawuyi Oke. All Rights Reserved.